← Wow! and I held them up…..
At the end of last September, for some unknown reason, Cockrobbinn and I decided that to have bikes would be a good idea. I am sure many of you already have bikes and see nothing unusual in this, but Cockrobbinn hadn’t been on a bike since the early sixties and me since probably the early eighties !! Once I get an idea in my head I am like a bull in a china shop so the very next day we were down in Camberley town centre at the local cycle shop and within an hour were were the proud owners of a brand new bike; the second one being delivered within a couple of days. We had decided to go for fold-up bikes so we could easily pop them in the car and head for areas we wanted to explore. The first thing to find out though was whether the old adage was true – ‘once you learn to ride a bike you never forget how’. It showed how mad we were as we had bought the bikes without even finding out whether we could still ride them !!! Trying to cycle around our garden was not the best thing to do; we kept nearly running over the cats who were wondering what on earth we were doing – and what were those crazy things on our heads – yes, we had bought helmets for safety reasons. I had a brainwave: it was Sunday and we live very close to the largest M & S / Tesco in the South and they have an enormous car park! We knew they closed at 4pm so we waited until about 6pm and drove up to the hopefully empty car park. It was almost deserted – there was a learner driver trying her best. Not caring what I looked like in my elegant silver/grey helmet, off I went and with a few cursory wobbles I pedaled away. It was great and also true that you never forget how to ride although I don’t think I would have liked to be riding on the main roads with the traffic as it is these days. Cockrobbinn’s turn next. Even he will admit to being extremely nervous of trying as he is not the most dexterous of men but after a few ‘quite big’ wobbles he was up and away. For the next hour or so we took it in turns to whizz around the car park ignoring the occasional passerby who looked on in amazement. The following weekend with both bikes safely stowed in the boot of the car, we decided to drive to Virginia Water – a short distance from us – and cycle around the lake; a distance of about 5 miles. Not far most will say, but after not having cycled for so many years it seemed far enough and it was also within Windsor Great Park, on tarmaced roads with almost no traffic except the pesky walkers who kept getting in our way! I won’t say we breezed around the lake; the hills tested out our leg muscles but we thoroughly enjoyed the trip and stopped halfway for refreshment from a little van. Virginia Water became a favourite of ours and we were soon venturing further afield in Windsor Great Park although remembering not to go at weekends when it can get really crowded and those pesky walkers ignored my ding-a-ling bell. Perhaps I should get a klaxon!! We didn’t do much cycling over the winter or early spring for a variety of reasons, but since Cockrobbinn has fully retired, I am finding that if I get in early enough, I can book a days geocaching in-between his singing practices, lunch dates, workouts and our visits to the Isle of Wight! We had a practice run on Sunday afternoon; made sure we remembered how to fold the bikes up and more importantly how to unfold them without catching our fingers and set a date for Tuesday. Route planned, weather looked promising, I was up early and had egg muffins in the oven before Cockrobbinn had ruffled his feathers. Lemon pepper chicken strips and home-made almond bread completed our picnic. I had bought Cockrobbinn a saddlebag for Christmas and it was amazing just how much stuff I could cram into it. I had also bought myself an iPhone holder for my handlebar so we could follow the GPS signal easily. Anyone would think we were planning a marathon but we drove 2.5 miles to Frimley Green, parked up a tiny track and unloaded our bikes onto the towpath of the Basingstoke Canal near the Guildford Road Bridge. There are 32 miles of the original navigation but we were only planning on doing a few of these miles this time. The towpath being in excellent condition, we soon reached the first cache of the day which was Frimley Viaduct (although I couldn’t see anything that looked like a viaduct anywhere around). A small clip top box was quickly found under a pile of sticks. It’s amazing how cycling speeds up the time between finding caches and we were upon Derelict Lock almost before we knew it. A 35mm canister craftily hidden away but soon found and the log signed. We were really enjoying this ride but perhaps the name of the next cache should have warned us! It was great speeding along following the GPS signal pointing straight ahead until it suddenly started veering left. One problem, there was a canal in the way. Diversion really did mean what it said. We had to clamber up flights of concrete steps, carrying our bikes, cross Deepcut Bridge from the southern towpath and follow diversions into the MOD open access woods along the northern bank. Apparently the next stretch of towpath on the southern side had been closed due to landslip and erosion and the next caches were placed on the northern side. On our return, we found that the original tow path had been repaired and it was an easy cycle back. As we headed into the MOD woodland we climbed and climbed and climbed and ended up carrying our bikes up what felt like a sheer cliff face. I really am surprised that we didn’t turn back but once at the top it was a superb ride along a forest track although a bit hard on the derrière crossing all the tree roots. We eventually came to a huge leafy hollow on our left and I left Cockrobbinn in charge of the bikes whilst I rummaged around in the leaves to find the cache called Diversion which was nestling underneath the end of a log. 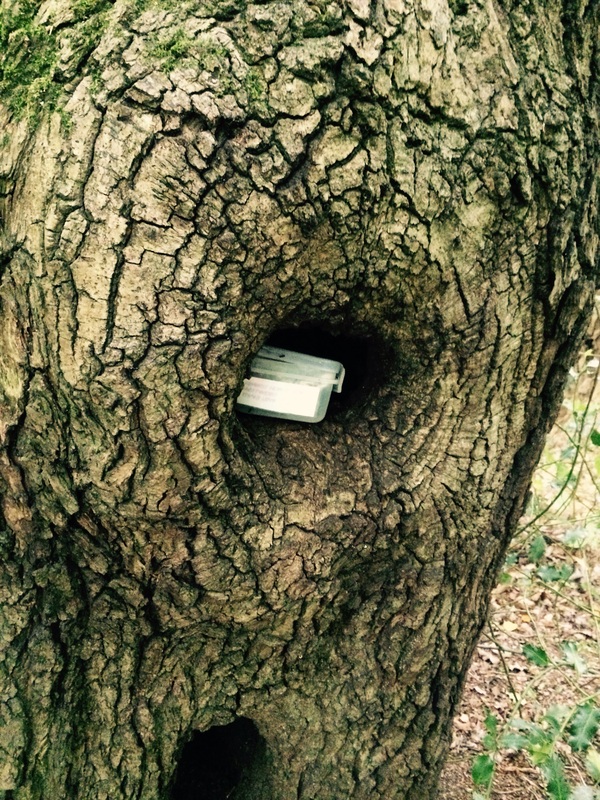 The next cache was one of my favourites of the day. A simple natural hiding place but well hidden out ‘in the wilds’ of Surrey. Fill-‘er-up was just off the little track we were cycling along and the cache was out of sight. It was one of those holes that I asked Cockrobbinn to put his hand in ‘just in case!’. Mind you, I’m not sure what creature could be hiding in there, not in England anyway. It was hidden so far back in the hole that it was impossible to see from the outside. An excellent hidy-hole. Lock Keeper’s Cottage.was next on the list. To reach this however we had to cycle down a tiny path which was very narrow, steep and windy with long grass growing on either side, barely room for the bikes to go through. Don’t forget we had to man-handle our bikes up some very steep banks earlier on near ‘Diversion’ so by the law of averages, we had to descend at some stage. We had been watching the canal from a great height for a while, making sure we didn’t veer to the right and down into the ravine! Being in the lead (naturally) I failed to see Cockrobbinn do a slow-motion lean to the left and end up sideways on the ground. 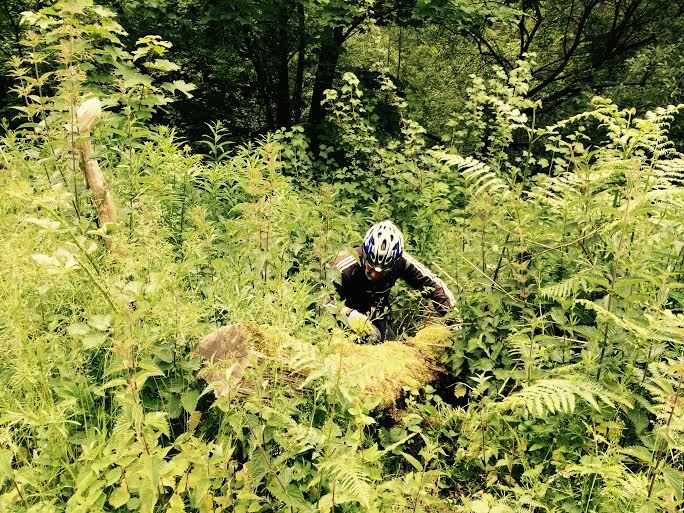 Thankfully a cushioned landing in the long grass meant he didn’t hurt himself but what a shame I didn’t get a photo. 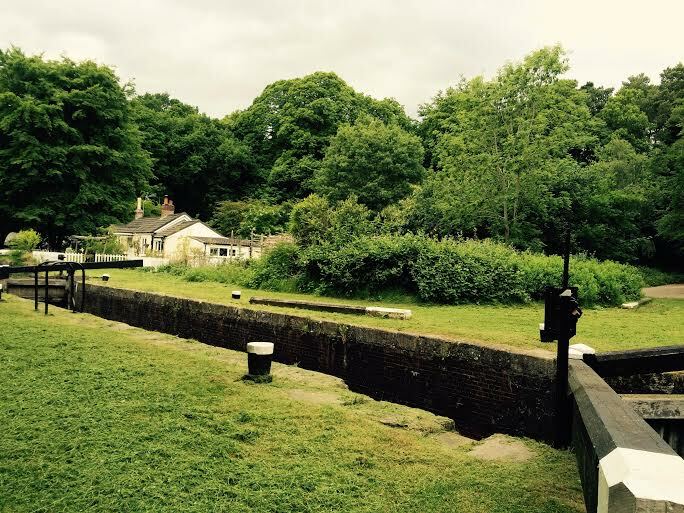 The Lock Keeper’s Cottage was picturesque; it was also where we crossed back from the northern towpath to the southern one. We were so engrossed looking at the lovely cottage that we overshot the little lane where the cache was hidden but we soon backtracked and found it. Interestingly enough, just opposite the cache were the old lock gates just laying on the ground. They seem much larger when out of the water. I would say onwards and upwards but looking at the way the locks were working, it was onwards and downwards! The Barge Trip from Hell was next on the agenda. Not really sure about the name but there was what looked like the remains of an old barge on the other side of the canal – perhaps that was the trip from hell. I love the photo of Cockrobbinn rummaging around in the undergrowth searching for the cache. Note he sensibly kept his cycle gloves on. The next cache looked promising in more ways than one: it was called LUNCH! Someone had done this route before and it was the perfect place to stop for our snack. 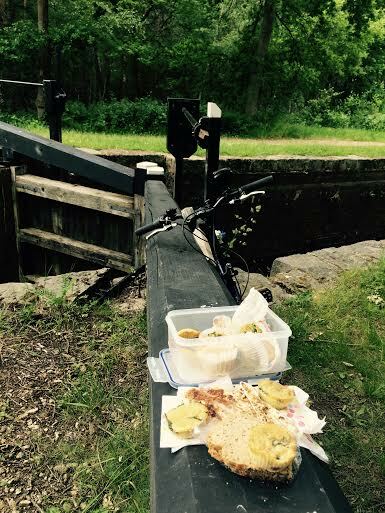 We soon found the cache hiding under some stickoflage, then settled down on the arm of the lock gates to enjoy our egg muffins, chicken strips and almond bread. Why does everything taste so much nicer when eaten outdoors on a picnic? The sun was out, there wasn’t a soul in sight; birds were singing, ducks paddling back and forth on the water – it was perfect. I think Cockrobbinn could have stayed there all afternoon but I was still keen to find another couple of caches near where we had parked the car. 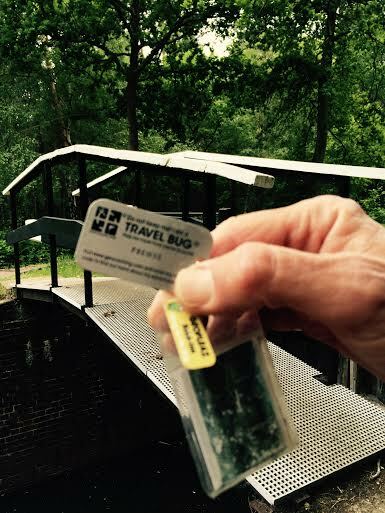 Just before we started heading back I decided that the cache ‘Lunch’ would be the perfect place to drop the travel bug Building Bridges which we had retrieved on the Isle of Wight. Part of the task for this travel bug was to have a photo taken by a ‘bridge’ so we decided that the little footbridge over the canal would suffice. This little bug had already travelled over 13840 miles from Wales to Canada and back to England. I was also pleased to be able to attach one of my little GeoFleaz tags which had recently arrived from the USA. I was so happy with these little tags that I had decided to order a larger quantity. They arrived a short while ago but I was a bit put out when I realized that I had to pay Customs duty on the second lot and also an £8 charge by the Sorting Office making them an expensive item! 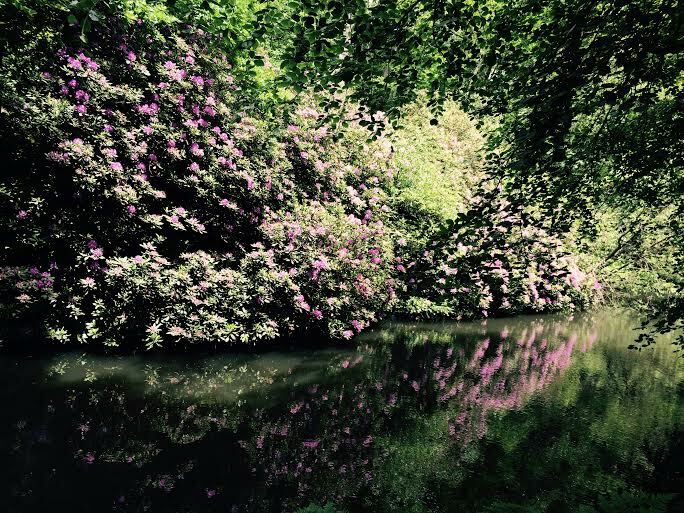 The route back, although slightly uphill was pure delight and the rhododendrons reflecting on the water made a beautiful picture. We had parked near Guildford Road Bridge and the cache of the same name was very quickly found. Unfortunately a huge tree near where it was hidden had been sawn down which had left the cache a tad exposed so we hid it a little further along and covered it well with sticks. A short walk along the road found us at a busy corner where the road sign Old Guildford Road was laying on the ground. As this was the name of the cache, I was convinced it had been attached to the sign and knocked off when the sign fell over; one of those little tiny magnetic nanos – but I could find nothing. This was turning out to be the hardest cache of the day to track down. Cockrobbinn started looking further afield whilst I continued searching around the old road sign. Eventually I started searching on the traffic sign – not sure if it was a ’30’ or ’40’ but we had previously found magnetic nanos hidden in these signs before, but definitely no nano here. But wait a minute – right up near the top of the sign, very carefully placed was a tiny plastic plug – barely visible – which could only mean one thing – I’d found the cache. Difficult to reach being a shortie but I managed it and our tweezers came in handy to retrieve the tiny log book roll. We had finished the day’s caching on a ‘high’ note!!! The local pub was soon found and we enjoyed a coffee in the deserted garden. The joys of being retired – empty pub gardens during the week. Our first cycle trip took place on 9th June 2015. 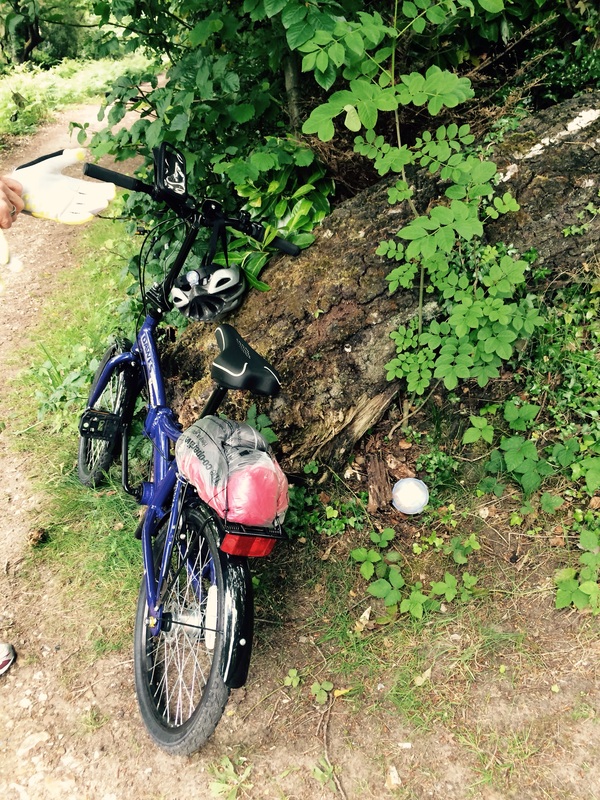 This entry was posted in Basingstoke Canal, Cache, cycling, Geocaching, towpath, Travel Bugs and tagged Basingstoke Canal, cycling, Frimley Green, Geocaching. Bookmark the permalink. I love the idea of caching on bikes, indeed I loved cycling as a kid, but today it fills me with visions of disaster lol. There is the possibility of a tandem but I have as yet to convince Shar to give it a try. I’ve only been on a tandem once – many, many years ago. My husband (of the time) kept accusing me of not pedalling as hard as him! But we did enjoy it.